Confirmation is a sacrament of initiation – the beginning of accepting new responsibilities in the Catholic Church. The other two Sacraments of initiation are Baptism and Eucharist. Although it is the last Sacrament of Initiation to be celebrated, Confirmation does not mark the end of a person’s formal religious education; rather it is the beginning of a deeper belief, a fuller involvement, and a stronger service to the Church. It is diocesan policy that the celebration of the Sacrament of Confirmation for our young people be held during the eighth grade year of school. 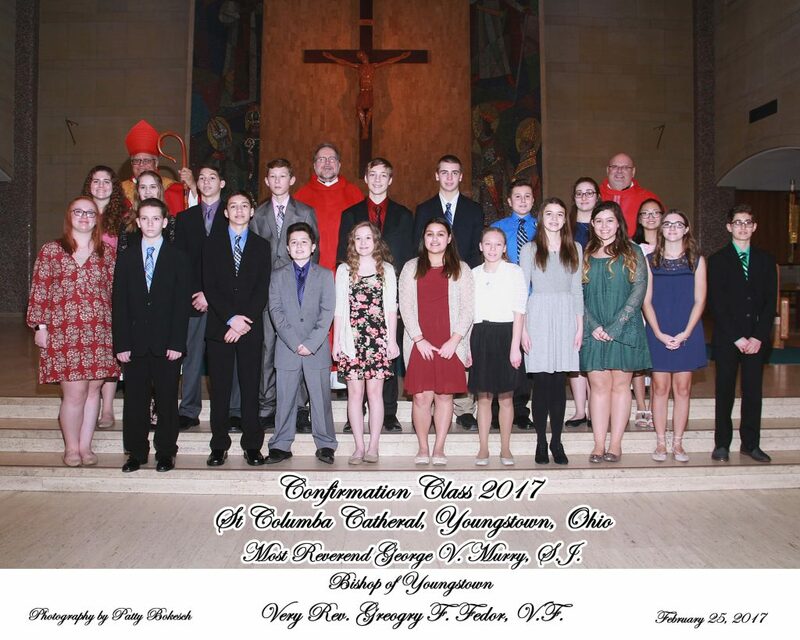 A separate preparation program for all eighth graders is also required by the Diocese of Youngstown along with being enrolled in CCD or Catholic School. Any adult who has been Baptized and made their First Communion, but has not been confirmed should call the Parish Office for more information on the sacrament. Adult Confirmation is celebrated at the Cathedral in the fall, and at the Easter Vigil in the spring. Appropriate faith formation is provided. congratulations to our 2017 confirmation candidates and their families!